Have you ever thought what you are going to do if the devil comes to your home? I have not but I guess I'll be quite confused. I would be even more tangled if I were a priest. But frankly speaking it might be somewhat interesting. It seems such an idea has been visiting the head of Roberto Benigni for quite some time cause twenty years ago he created another one of his funny even though not so original movies. Il piccolo diavolo (The Little Devil) is not very popular around the globe or at least it is not so famous as Benigni's 1997 multiple Oscar winning film La vita è bella (Life Is Beautiful) but it is still a signature effort of the Italian director. The story of Il piccolo diavolo (The Little Devil) is about Father Maurice / Maurizio (Walter Matthau), a priest in Roma who recently has fallen in love with Patrizia (Stefania Sandrelli) and who is confused about his feelings for her. While he tries to clear up his relation with Patrizia, they call him to exorcise a demon from a woman. While Father Maurice is not completely convinced he has just exorcised the devil from that lady, he is soon forced to believe by the "dark" creature himself. He is called Giuditta and he's in the form of a naive, laughing and funny looking man (Roberto Benigni). The last thing you'll think about him is that he is the devil. Or a devil. But he is although he's a young and inexperienced one. Maurizio has no choice except to believe what he sees and soon that little devil is going to change Father Maurice's clerical life. 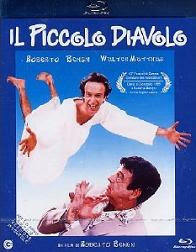 While Il piccolo diavolo is not the most original film and it bears the signs of a typical Roberto Benigni's comedy, it is still a very funny movie with lots of comical situations. The easy-going, fun-loving and disastrous little devil is a perfect counterpart for the steady, respected and helpful Father Maurice. Still, we have to believe that a stoic priest could live together with a clownish devil at least for some time. Matthau and Benigni are a great choice for the parts and their interactions are incredible. From their every day look to their acting abilities the cast hardly could have been bettered. You are not going to see any devil's horns, tails or other specific attributes in Il piccolo diavolo. There are no money wasted in glossy special effects and there is not any need of such. All of the film's devilish features are presented through dialogue, acting and a couple of mirrors. In fact, the movie needs no devils to entertain but the presence of a "hellish" creature brings some fresh nuances to the plot. The film shares the common "problems" of Roberto Benigni's pictures. His acting is not the most varied and if you've seen a movie made by him you know what to expect. And of course, Benigni's real life wife Nicoletta Braschi is as usual here. To be honest, Braschi does quite a good job in the role of playful Nina and Benigni is born to perform parts of little devils like Giuditta. Add Walter Matthau and you'll get another reason to see Il piccolo diavolo. Finally, the ending is moderately surprising giving this balanced movie a good finish. Il piccolo diavolo could be also looked at as a subtle satire of religious and other social beliefs and habits but it is better appreciated for its fun side. The movie by no means is a must see feature and it is clearly not in the league of Benigni's La vita è bella, yet it is enjoyable effort and brings plenty of laugh if you are in a mood for a comedy. Explore our Review Maze to read more movie reviews.